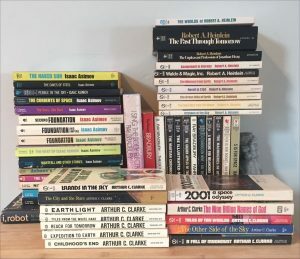 Since my ‘retirement’ in 2012 I’ve begun revisiting classic and favorite authors of science fiction, many of which I first discovered as a teenager, to see how well they hold up against newer writers, to see if and how their premises have become obsolete in light of changing technology and scientific understanding (see General Nonfiction), and to what extent they inform my ‘Provisional Conclusions’ (see link in menu). 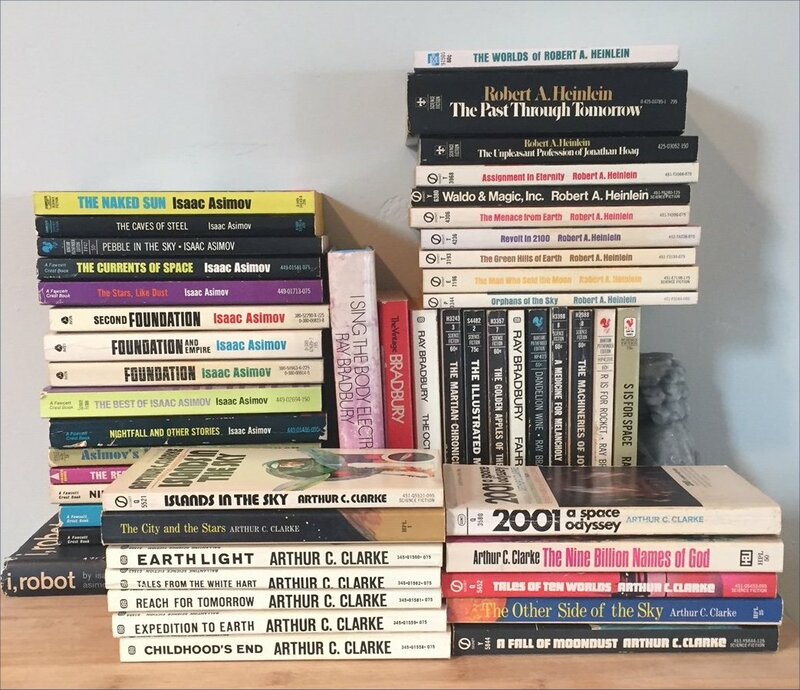 Here’s a photo of the paperbacks I bought by those core BACH authors — Bradbury, Asimov, Clarke, Heinlein — with a couple book club editions, books I’m gradually reworking my way through. 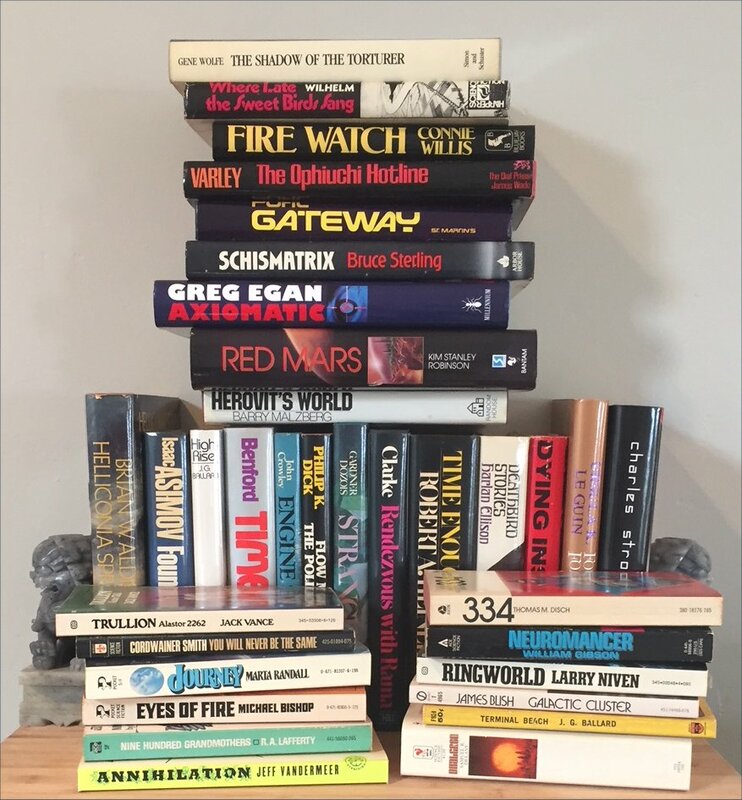 At the bottom of the page is a photo of some of my favorite SF books of all time that I have in first editions. The book lists here focus on short fiction collections, for now, listed by author in chronological order. The * indicates a collection consisting mostly of stories already included in earlier collections. Part 1: pulpy prose : The unfortunate pulpy prose of Asimov’s earliest stories — those vicious adverbs. He got over it. 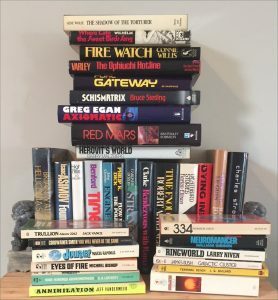 Part 2: summary of themes and patterns : How Asimov’s stories are mostly puzzle stories; how not all of his robot stories reached consistent conclusions.